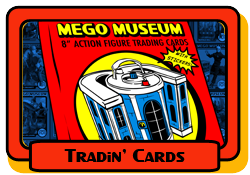 I have these Mego Museum cards to trade. I am looking for almost anything Wizard of Oz, cards, books, magazines,etc. I also have #'s 39, 41, 77, 82, 86, 87, 88 which have some condition flaws. Last edited by MegoOz; Jan 10, '19 at 3:54 PM.